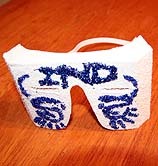 The IND Penguins come from the Institute of Notre Dame, an igloo topped by a penguin. 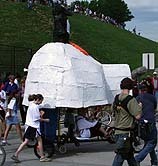 Pilots Amanda Ward and Caitlyn Cook powered the sculpture through the race. 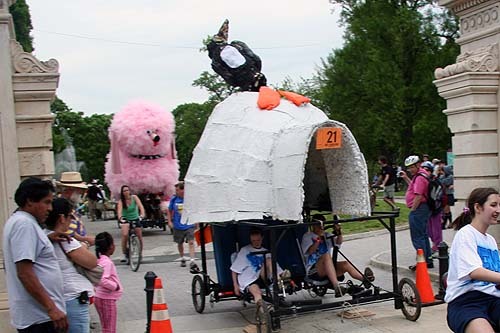 The penguin had a lean for the latter part of the race after colliding with a tree limb in Patterson Park. 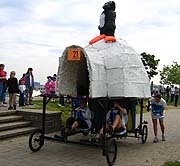 They won Best Pit Crew for the crew’s willingness to carry the sculpture for great distances as the result of breakdowns, and they won Best Bribes for their hand-glittered arctic cardboard goggles with slits to peer through.